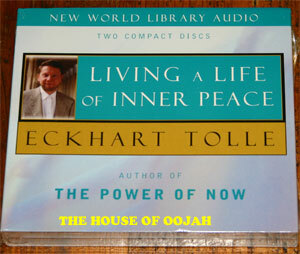 Living a Life of Inner Peace is a recording of one of Eckhart's most moving, transformative talks. The talk is relaxed and funny, and he conveys his message through stories and insightful observation. Eckhart makes us laugh at ourselves - while helping us break through habitual thinking to discover the eternal presence of the Now. When you listen, you discover that something deeper is happening beyond the words being spoken. A field of alert stillness arises where before there was mental noise. You find yourself in what Eckhart calls a state of presence - and it can lead to a dramatic transformation in the way you live your life. Reality- life - and the present moment are one! This statement is not to be thought about. It is to be lived! The Now, as Eckhart in his gifted way explains, is beyond the limits of thought and the "form" that this moment takes. The Ultimate Reality cannot be fully understood with the mind. But you can align yourself with it. In Eckhart's own words, "You are the Now." In this series that takes the introductory teachings to a deeper level, you will learn to access the power of Now and live a life of inner peace and harmony. For those new to Eckhart's teachings, this is an ideal introduction. For those familiar with his work, be prepared for something fresh and extraordinary.